My neighborhood farmer's market started up again last week. Hooray!! Hubby and I were happy to see our favorite butcher/farmer, our favorite pasta guy (omg his wild boar plin is TDF), bakers, fruit and veggie peeps. With farmer's market seasons starting up again (or perhaps yours never stopped, in which case I'm totally jealous), I thought I'd put together a few outfits perfect for strolling your way past the stalls of vendors and farmers. If you don't have a farmer's market near by, no worries. These outfits would be lovely for many a summer outing - picnics at the beach, reading in the sun. Ok, I couldn't resist putting the caranday up here again. (There's a red one in size 4 on ebay here right now). But a floaty cotton dress meant for summer seems so picture perfect for the farmer's market. As you pick out your fruit and veggies, don't forget your sun hat! How about going casual with a lovely floaty top and shorts? Keep it relaxed with your canvas slip-ons (kept interesting by the stripes). Don't forget your reusable tote to bring your farm-raised goodies home. Finally, with the advent of farmer's market adventures, I thought I'd leave y'all with some recipes we enjoyed this past weekend after visiting the farmer's market. I find the goodies at the farmer's markets always prompt me to try out new produce or meat varieties and new recipes. Steamed clams are a perennial favorite of ours, but the standout of the meal was the asparagus, avocado, pea vine and tomato salad my hubby whipped up. Hope you enjoy! 1. Melt butter in a large skillet over medium heat. Cook with diced bacon for a few minutes. 2. Add garlic and cook briefly. 3. Stir in wine, and season with oregano, parsley, and red pepper flakes. 4. 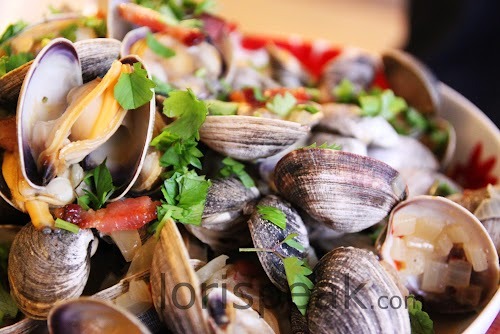 Place clams in the wine mixture. Cover, and steam until all the clams have opened: discard any that do not open. 5. Serve family style in a big bowl. Squeeze a bit of lemon over the top for brightness. 1. Toss tomatoes with salt & some sugar to juice em out. let sit for a bit. 2. 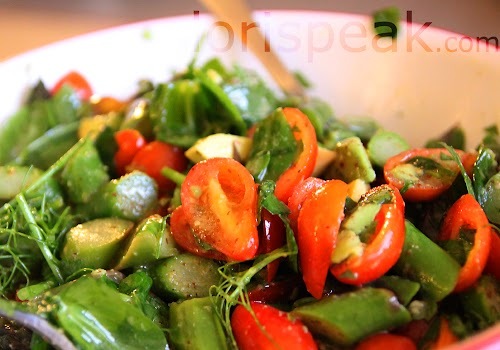 Toss in asparagus, pea vines, parsley, chervil, and dressing. Let sit for a bit. 3. Mix in avocado. Check salt, pepper to taste. Serve! That tomato salad looks divine! How long do the farm markets normally last for? End of the summer? Great outfits, I love the one with the shorts. Yummy yummy! Your recipes look delicious. I need to get to the markets and start hunting for garlic scapes. I was at Ballard and Redmond a few weeks ago and there wasn't a ton of produce. Looking forward to the summer! Such cute outfits -- I would wear them all in a heartbeat. And the food looks absolutely delish! I love local produce and farmer's markets. I do live in the Garden State, after all : ). I just joined a CSA and my first order arrives on Friday. Can't wait to see what comes!